This year’s Supercomputing conference got underway in Austin, Texas with over 12,000 attendees- the largest gathering yet. People from all over the world and from various disciplines came together to reconnect, share, and learn – All to celebrate how high-performance computing (HPC) is fueling insights, discoveries and innovation. 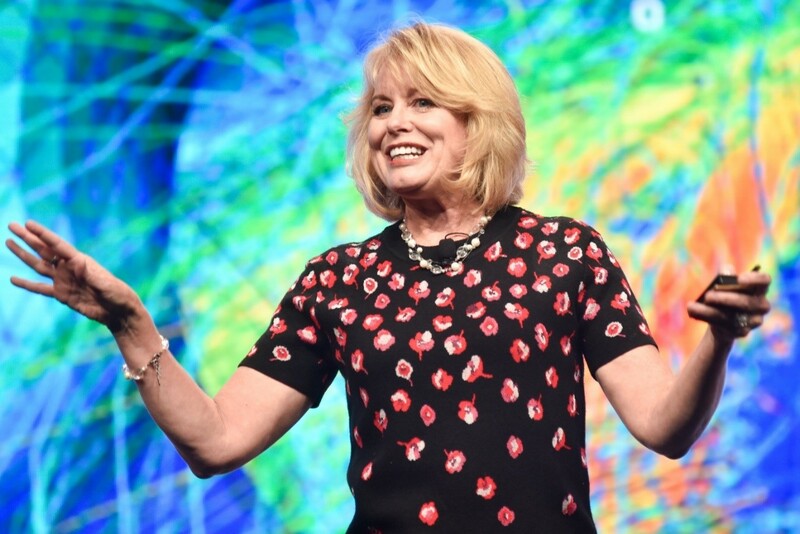 Intel’s Senior VP Diane Bryant opened the conference with her plenary speech delivered to a full house. The theme, HPC Matters, resonated with this crowd for obvious reasons. Diane discussed how HPC has entered a new era where the technology and the cost of advanced computation have reached a cross point of accessibility. 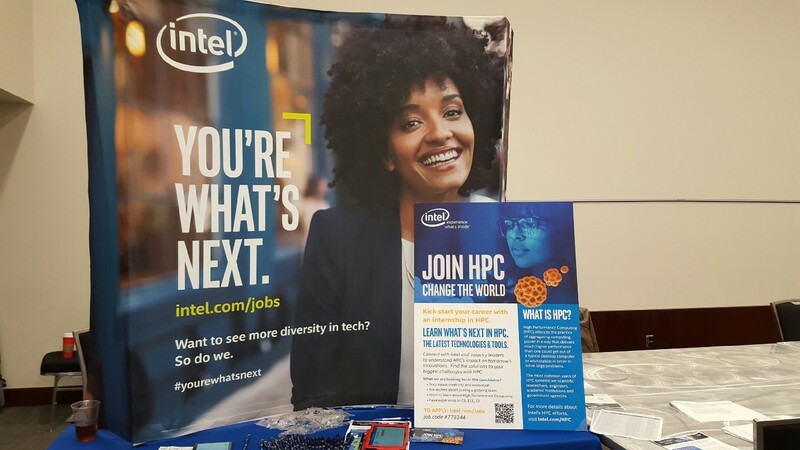 Diane reinforced Intel’s commitment to advancing diversity in the area of HPC by announcing a new scholarship program Intel will fund for the next five years to enable women and minorities with science, technology, engineer and math (STEM) undergraduate degrees to pursue graduate degrees in computational and data science. Dedicating US$300,000.00 per year, the scholarship will be administered in conjunction with SIGHPC, the ACM special interest group on HPC and the Supercomputing diversity committee. Intel announced the launch of Intel Omni-Path Architecture (Intel OPA), an element of Intel Scalable System Framework (Intel SSF). This new fabric has been eagerly anticipated, with many HPC ecosystem partners already onboard in the Intel® Fabric Builders program to rapidly deploy Intel OPA because of the significant performance and cost benefits. Charlie Wuischpard, VP of Intel’s Data Center Group and Barry Davis, GM HPC Compute and Fabric kicked off the Omni-Path celebration in the booth Monday evening to thank to everyone who worked to develop and deliver Intel Omni-Path Architecture. Listen to Dr. Al Gara, Intel Fellow and Chief Architect for Exascale Systems for the Data Center Group talk about how Intel® Scalable System Framework is meeting the extreme challenges and opportunities that researchers and scientists face in HPC today. To continue to advance HPC, it takes a community dedicated to cooperation. Intel was honored to announced a number of new strategic alliances at SC15, including Barcelona Supercomputing Center (BSC), Alan Turing Institute (ATI), and Pittsburg Supercomputing Center (PSC) in addition to continued work with many others. Of note was the public unveiling of the OpenHPC Community, a Linux Foundation Collaborative Project. Intel, as one of the 34 founding members of OpenHPC, wants to bring attention to the charter of the organization to provide a new, open source framework for HPC environments with tools, components, and interconnections to enable the software stack. The community will provide an integrated and validated collection of HPC components that can be used to provide a full-featured reference HPC software stack available to developers, system administrators and users. Listen to Karl Schulz, Principal Engineer of the Enterprise High Performance Computing Group at Intel discuss the OpenHPC community effort. Go to the Intel Newsroom for more details. Supercomputing supported a growing number of student events this year, including workshops, sessions, competitions and even recruiting made this an event for the younger generation. 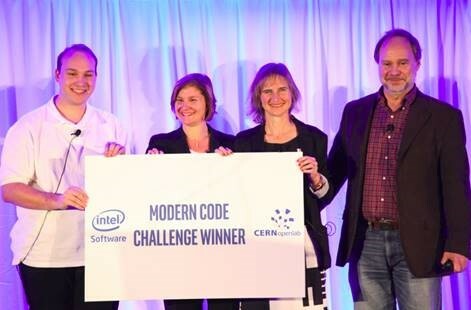 Intel and CERN openlab jointly announced the winners of the Intel® Modern Code Developer Challenge on November 14, 2015 at the annual Intel® HPC Developer Conference, held in conjunction with the SC15. Targeted at student participants, the goal of the contest was to spur advancement in parallel coding and the science it supports, while encouraging students to pursue careers in the field of high performance computing. The students were challenged to improve the runtime performance on code that allowed the simulation of interactive brain cells during the formation of the brain. Out of the roughly 1,700 students, representing 130 universities across 19 countries, Mathieu Gravey, a PhD student from France, submitted the fastest optimized code to win the 9-week internship at CERN openlab. Mathieu optimized the code so the original 45 hour run time was reduced to 8 minutes 24 seconds. Representatives from CERN and Intel were in Austin to award Mathieu the grand prize, plus recognize first place with a guided tour of CERN in Switzerland and second place with a trip to SC16 next year. Congratulations to everyone who participated- it was a great experience working with such a talented group of young HPC enthusiasts. Plans are already underway for SC16 next year in Salt Lake City, Utah…. can’t wait to see what’s next!